This is Ludo my favorite bunny. Hand screen printed bunny, perfect for kids rooms. Our best selling birch wood tray and our beloved cushion featuring Ludo the bunny on one side and his friend the Maximilien the magician on the reverse. Do the dishes on Easter Sunday with the colourful bunny tea-towel & be rewarded with a cup of tea in our fine bone China mug. As an extra treat for our customers 💕, we will include a FREE Un Dimanche à Paris tea towel in every order placed between today and Sunday 21st October. Last time I watched so excitedly a football game was in 1998!! I cannot believe that 20 years has gone by!! I was 21 years old and I remember so vividly working with my best friend on a beach hut/bar/restaurant in Saint Tropez and celebrating the French World Cup like crazy! Watching the final last night with my kids was so much fun! I am very proud my country. Bravo les Bleus! While the children were cutting their colourful flowers ( see previous post) I made a quick sketch of a bouquet and then cut it up! 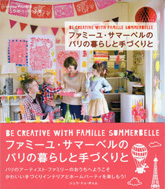 I've already asked my followers on IG, wondering if we should make this a Famille Summerbelle product? And if so which colour? Please leave me a comment as I'd love to hear your thoughts! Free gift wrapping for all your orders! To save you time on your last minute Christmas shopping we're offering to wrap all your orders for FREE.You can also add a pretty card with a note, just let us know when you place the order. Your presents will be ready to go straight under the Christmas tree! And to make it easier, we have selected some very special gift pack! Winter Tableware collection, a collaboration with ENGEL. Following the success of the CIRCUS bamboo tableware collection, I am delighted to show you this latest WINTER tableware collection I designed for ENGEL. This beautiful collection includes a range of Large, Medium and Small size plates with 3 Winter scene paper cut illustrations, a beautiful range of colours, a large cake plate, candle boxes and an assortment of 12 mini wooden icons to decorate the Christmas pudding! This new collection will add a touch of magic to your festive dinner table! The Winter collection is available now at ENGEL. The plates are made of 100% biodegradable bamboo and are dishwasher safe. These are the original paper cuts that were the inspiration for the Winter collection. This Christmas we're introducing the Copenhagen map to our very limited edition of GOLD PAPER CUT MAPS! Also available: Paris, New York City, San Francisco, Amsterdam and London. Copenhagen, our new paper cut map! After long months in the making, I am very happy to share with you our latest map of Copenhagen! This map was a real pleasure to draw and cut. There is so much to feature in this stunning City! Few years ago we had an amazing time discovering Copenhagen with the children over a long week-end. There are so many things to do in Copenhagen, like climbing the ancient cast-iron staircase of the glass building of the Botanical Garden to observe the palm trees from above, riding atop the Ferris Wheel in Tivoli Gardens, cycling along the waterfront of the 5 lakes and stop for Pølser the Danish hot dog! Visiting the Amalienborg Palace to see the change of the Royal Guards. There you can see from afar the elegant flat roof of the Opera House. Or even climbing up the Rundetaaren to get the most magnificent view of the old City with its colourful facades and red roofs. 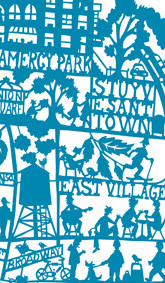 The map is available now as a paper cut (laser cut from the original paper cut) in Black and Blue. You need a lot of blades to cut a map like this one! I use the 10A blades from Swann-Morton to do all my paper cuts. Ready for a new school year! Now we're back in Amsterdam and I have to say I am very happy to get back to work and plan the year ahead. Téo started his new nursery - in Dutch - Lucien is back to the French school in CE2 and Ophelia is moving to Secondary (how did this happen so quickly?!?). For her no more French at school but Dutch and English. She will be fluent in Dutch in no time! She started her new school this morning, a bit nervous but also very excited about this coming year. Illustration from Flow magazine. Wooden spoon painted by Ophelia. World map notebook by Famille Summerbelle. Ophelia drawing pretty illustrations on Famille Summerbelle notebook. The House Boxes for storing all sort of things. Friends book - Vrienden Boek - a must for the new school year ahead! Wooden spoon painted by Ophelia. Our Special offer on our House Boxes continues this month. Buy 5 boxes for the price of 4! Useful for all kinds of storage, the boxes add a little colour to tables and bookshelves while helping to keep the small items under control. Our house boxes are one of the best sellers at Famille Summerbelle. Useful for all kinds of storage, the boxes add a little colour to tables and bookshelves while helping to keep the small items under control! 5 BOXES FOR THE PRICE OF 4! For the month of June we're offering an additional box FREE with every purchase. CLICK HERE to purchase now. On Wednesdays, Ophelia (10 years old) and Lucien (7) finish school at midday so I often plan creative activities to do together. Last Wednesday we decided prepare for Easter with a fun egg decorating afternoon. That same morning I went to the market with Téo (2) to buy a selection of branches to display on our kitchen table. To give it an Easter touch we added onto it the decorated eggs and some tiny yellow fluffy cheeks that I got from Hema. As a special offer in the lead up to the Easter weekend, Famille Summerbelle is offering a FREE 'Ludo Lapin' tea towel with every basket that exceeds €60 | £55 | $65. Nothing to do at checkout, we'll just send you the tea towel in your parcel. !Offer ends Sunday 23rd April 2017! Ludo the bunny, birch wood tray. The Performers fine bone China mug. We've put together a small gift selection to make it easier for you to get started on your Christmas shopping! Enjoy!